(INDIANAPOLIS) March 27, 2018 – Preferred Freezer Services announced today a continuation of their partnership with Ed Carpenter Racing for the fifth consecutive year. ECR’s No. 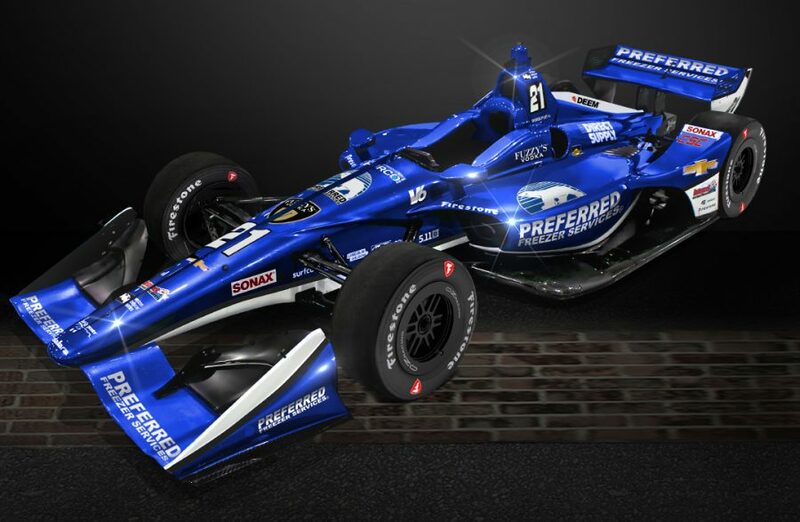 21 Chevrolet will showcase the classic blue and white Preferred Freezer Services colors at four Verizon IndyCar Series races this year, including the 102nd Running of the Indianapolis 500. Preferred Freezer Services (PFS), a global leader in advanced design and engineered temperature-controlled warehouses, first teamed up with Ed Carpenter Racing to field a second car for the team in the 2014 Indianapolis 500. The company has supported ECR’s Month of May program each year since, serving as primary partner on five entries in the 500-mile race in the past four years. Of those five entries, four have yielded Top 10 finishes, including a 3rd place in 2016. After two seasons as the road and street course driver for ECR, Spencer Pigot has moved to the No. 21 in 2018 and will compete in the No. 21 Preferred Freezer Services Chevrolet. The Preferred Freezer Services Chevrolet will revert back to a predominately blue scheme, last seen on the No. 21 in the 2016 Indianapolis 500. The livery will reemerge on track for the first time at the 2018 Toyota Grand Prix of Long Beach. The No. 21 will also run as the Preferred Freezer Services Chevrolet at the INDYCAR Grand Prix and the Indianapolis 500, both held at the Indianapolis Motor Speedway. Additionally, PFS will adorn Pigot’s car at the Honda Indy Toronto, the only international stop on the 2018 schedule. PFS will continue as an associate on the No. 21 for all other races this season. Preferred Freezer Services offers the most modern, state-of-the-art, full service temperature-controlled warehouses in the United States. PFS operates 37 facilities in nine regions nationwide and has just commenced construction on their 38th, a new Los Angeles-area facility named Big Bear. The company has also expanded internationally with cold storage warehouses in both China and Vietnam. Pigot will join ECR team owner Ed Carpenter on the annual visit to PFS’s headquarters in Chatham, New Jersey in late April. Next week, Ed Carpenter Racing will embark on a swing of three back-to-back race weekends. The next stop for the Verizon IndyCar Series is the first oval race of the year on April 7, held at ISM Raceway in Phoenix, Arizona. Carpenter will race alongside Pigot in the Phoenix Grand Prix, which will be the first race of Carpenter’s 16th season of Indy car competition. The Speedway, Ind.-based team will remain on the West Coast for the Toyota Grand Prix of Long Beach on April 13 before heading to Barber Motorsports Park for the Honda Indy Grand Prix of Alabama on April 22. British newcomer Jordan King will step into the No. 20 for the road and street course events, including Long Beach and Barber.